"There's so much beauty in this old music, and it affects me on a deep level." For nearly 2 decades Willie Watson has been making modern folk music rooted in older traditions. Folksinger Vol. 2, produced by David Rawlings, carries on a rich tradition in folk music: the sharing and swapping of old songs. With his rich vocal range, Watson breathes new life into classic songs like 'Samson and Delilah' featuring harmonies of gospel quartet the Fairfield Four. Arriving three years after Folksinger Vol. 1 - his first release since parting ways with the Old Crow Medicine Show - Vol. 2 carries on the spirit of a time nearly forgotten. Holly Arrowsmith's sophomore album, A Dawn I Remember, is already gaining critical acclaim, alongside an APRA Silver Scroll Top 20 nod for closing album track, 'Slow Train Creek'. Sunday Star Times gave the album a five star review while Otago Daily Times compared her vocal performance to an "early Joan Baez or the superstar voices of Joni Mitchell and Emmylou Harris." The album was recorded between the beautiful coastal town of Colac Bay and The Sitting Room Recording Studio with renowned producer Ben Edwards. Holly Arrowsmith's music often touches upon earnest matters of life, wrapped up in metaphors of nature and the soothing mountain environment that raised her. Steve Gunn is a New York-based guitarist and songwriter. With a career spanning nearly fifteen years, Steve has produced volumes of critically acclaimed solo, duo, and ensemble recordings. Close listening reveals the influence of blues, folk, ecstatic free jazz, and psych in his continually unfolding output. In 2016 Steve released, Eyes On The Lines, his first album for Matador Records which the Washington Post called, "so intimate and so mysteriously distant all at once". Volume II is the long awaited second album from acid folk troubadour Arthur Ahbez, and follow up to 2013's critically acclaimed Gold. Best described as a soul lost in the spirit of song, Arthur finds solace in the ethos of Jazz, Folk, and Psychedelic movements of the 1960s. It is with great regret we advise you that TONY JOE WHITE has been forced to cancel his upcoming Australia / New Zealand shows this October due to severe back pain. Tony Joe is not a young man, and after a recent show at Nashvilles legendary Ryman, the great man was almost unable to walk after suffering severe pain in his calves and had to be helped off the stage while in extreme pain. Since then the discovery of a bulging disk in his back has meant an immediate end to future engagements that involve significant travel until physical therapy can hopefully reinstate him to a healthy state for travel. Sadly, it has been very difficult to find a replacement, especially at such short notice for this night of the festival. And the decision has been made to cancel this date of the festival, 10th October. Ticket holders have the option to receive a full refund which will be processed automatically on 21 Sep or if you would prefer to transfer your ticket purchase to the similarly priced Margo Price show on 17 Oct please contact Ticketmaster before 5pm on 19 Sep.
Additional tickets you may have purchased through the red/white/blue scheme remain valid. Festival Pass ticket holders will automatically receive a partial refund. Alternatively, if a full refund is desired please contact Ticketmaster. From tour promoters. Were sorry to have to cancel this night of the festival but hope there is something else in the line-up that interests you. Were very sorry for any inconvenience caused. If you booked online or over the phone, please click here to submit your refund request and remember to include your booking number. The refund process can take up to 5 days. Once processed, please allow 3-5 days for the funds to show on both your balance and statement. If the credit card used to make this has changed, your original card has expired or is no longer valid (prepaid Visa and MasterCard included), youll need to contact the Customer Service Team by submitting a request here requesting a refund with your bank account details. Please remember to include your order number in your request. If your tickets were purchased from a Ticketmaster outlet, youll need to return to that outlet with the tickets and credit card used to make the booking. After touring and recording with Finn Andrews (The Veils) Reb Fountain released 'Hopeful & Hopeless'; "the most perfect EP ever made," (Simon Wilson, Metro). The album, recorded live at Auckland's Wine Cellar, recently won a Tui award for Best Country Album 2018 and title track, 'Hopeful & Hopeless' won APRA Best Country Song 2018 and it doesn't end there! The much awaited follow up, Little Arrows, featuring the late Sam Prebble was nominated for Best Folk Album 2018. "Reb Fountain is to be counted among our finest songwriters whose imagery is both personal and universal, and her command of a melody and a song transcends genre." (Graham Reid, Elsewhere). NZ's hardest working band, The Eastern, have been roaring around the music scene for ten years and with four albums and well over 1000 shows under their belt, they have no plans on stopping soon! Best known for their 2012 record, Hope and Wire a bold double album that reached Gold Status, climbed to #2 in the NZ Charts and debuted at #1 on the NZ iTunes chart. They have played and toured with Fleetwood Mac, Steve Earle and Old Crow Medicine Show amongst others and manage to tick off 200 shows a year every year! No Depression mag described the band as "One of the most modern roots acts from any country" and Radio NZ and NZ Herald hailed them as "National Treasures." NZ Country legend Barry Saunders simply called them "The truth." Wellington based indie-folk songstress, Emily Fairlight has been composing and performing for over a decade, carting around her introspective alt/folk through New Zealand, Australia and the USA. She recorded her sophomore album, Mother Of Gloom, with Doug Walseth of The Cat's Eye Studio in Austin, Texas. Second Hand News described the album as "deft and exquisite, drawing you completely into Fairlight's stories," and Radio New Zealand praised the songs for distilling "moments of emotional turmoil into palpable images anyone can feel." "One of the most compelling country talents to come out of Nashville" (Vulture). Margo Price's first solo album Midwest Farmer's Daughter debuted in the top 10 on Billboard's Country Albums chart and graced Best-Of lists everywhere from Entertainment Weekly to NPR Music. Most recent release, All American Made was written alongside partner/husband Jeremy Ivey and unapologetically depicts the trials of everyday life, politics and sexism. It was hailed as "a potential classic," by Pitchfork and Rolling Stone praised its "amazingly vivid songcraft". Passing up on a more slicker, polished sound, Price has been lauded for her commitment to the grit and honesty in her music. Courtney Marie Andrews is delighted to return to NZ once again, "New Zealand, I adore your beautiful country and I can't wait to make my way back there the third time!" She played her first NZ show in July 2017 following the success of her album Honest Life. The crowd described Courtney's performance as "exquisite", "utterly brilliant" and Courtney herself said the downunder tour was "pure joy". So much so that she came back that November and delighted the crowd with news that she'd return again with a new album. And that she will. Recorded over eight days and produced by Mark Howard (Lucinda Williams, Bob Dylan, Emmylou Harris, Tom Waits) Courtney revealed May Your Kindness Remain a record dedicated to the people she met on the road. Also to once again offer enthusiasts the chance to see more acts and to encourage music fans to discover new artists, the festival will have a special ticket pricing scheme, enabling them to receive discounts on multiple ticket purchases. Each show is colour coded. Buy a ticket to a red show, and you can buy tickets to white shows at 25% off and blue shows at 50% off. White show ticket buyers can get blue show tickets at 25% off. These offers are only available for advance purchases. All tickets to the festival are sold exclusively through Ticketmaster. You can buy tickets online, on the phone (0800 111 999) or in person at one of their box offices. Limited Festival Passes are also available. 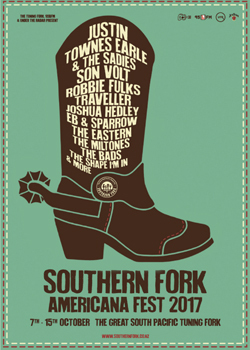 What is Southern Fork Americana Fest? 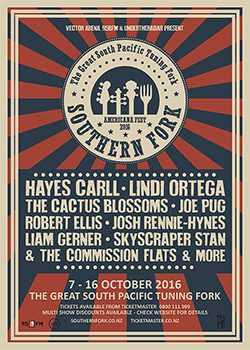 The Southern Fork Americana Fest is a multi-night festival of the best in Americana music, which is held annually in October at The Great South Pacific Tuning Fork at Spark Arena in Auckland. Tickets are available exclusively from Ticketmaster. What are the running times for the festival? The Great South Pacific Tuning Fork is found on the right hand side of the plaza at the front of Spark Arena. What's with the different coloured stamps on the shows? Glad you asked! To offer you the chance to see more acts and help you discover new acts, we've put in place a unique pricing scheme that will enable you to receive discounts on multiple ticket purchases. Each festival show has a separate colour coding (Red, White or Blue). 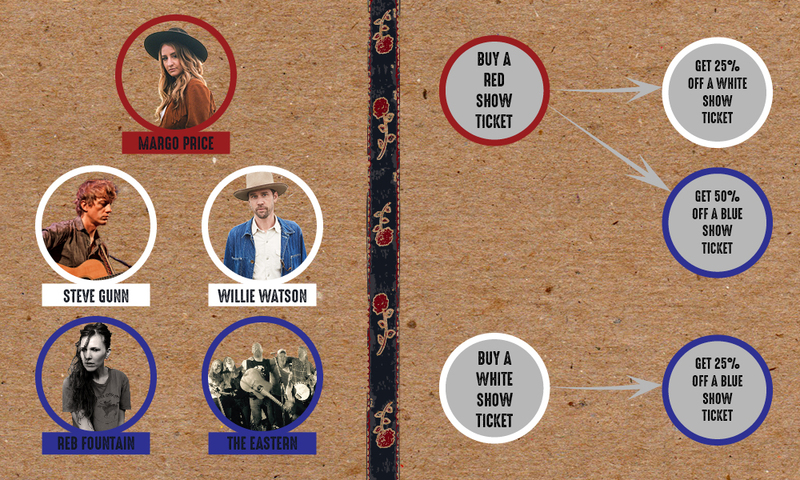 If you buy a Red show ticket, you'll be eligible for discounts on White and Blue shows, and if you buy White tickets, you'll receive a discount on Blue shows. See Ticketmaster.co.nz for all the terms and conditions, and full details on how it all works. Why should I sign up for your mailing list? We love the sort of music and performers who play at the Great South Pacific Tuning Fork and we know there are tons of you out there who feel the same. If you sign up, well send you notifications of upcoming shows and the occasional enews to keep you abreast of things coming up. We promise we won't harass you, spam you, sell your info to advertisers or otherwise drive you nuts, so scroll down to the bottom of the page to sign up. 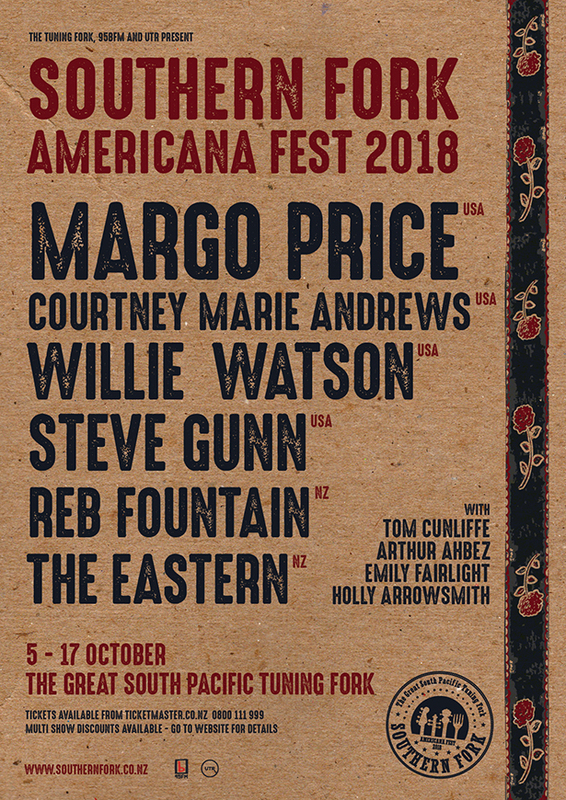 The Southern Fork Americana Fest over the past four years has hosted a throng of americana music's finest and most exciting talents on the scene. From Grammy winner Ryan Bingham and his hard-rocking band to feisty country gal Nikki Lane, to the powerful harmonies of Jamestown Revival, to the classic sound of Justin Townes Earle and the otherworldly vocals of kiwi songstress Aldous Harding and more. 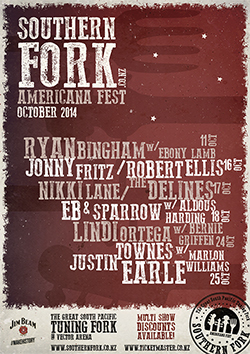 Every year we discover more talent in what has become an annual celebration of alt.country and americana music. We couldn't host such amazing artists without the support of an equaly amazing audience. We hope to keep delivering you a diverse and fresh line up year after year. 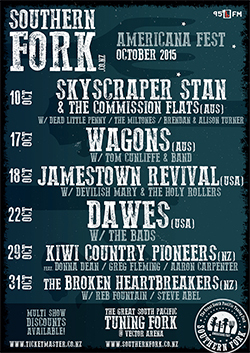 For all questions about the festival or other shows at the Tuning Fork, either give us a call on (09) 358 1250 or email us on info@sparkarena.co.nz. For ticketing enquiries call Ticketmaster on 0800 111 999.